EDIT: This retreat is currently sold out. If you want to be the first to know the next time I offer a retreat, make sure you're signed up for my Health Notes newsletter. 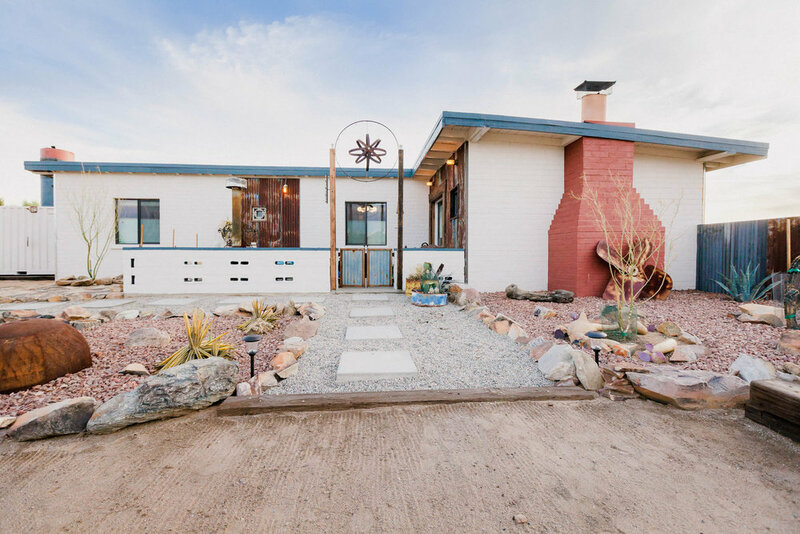 Hi-Desert Healing is a healing retreat co-facilitated between myself and my dear friend and wonderful coach, Sandra Kermode. This will be a time and space for us to feel wild, free, and connected to the sacred land of the Mojave desert. Space will be held for your healing, nurturing, and releasing. We'll be focusing on personal healing during our time together, empowering you with tools that you can carry back into your daily life to continue the healing process. Activities planned for the retreat include daily Breathwork, yoga, a workshop on limiting beliefs, a guided hike in Joshua Tree National Park, and more. We'll be staying at a beautiful hi-desert ranch, complete with two hot tubs, a pool, hammocks, and tons of nooks and crannies to relax in. Rates vary by room and include all meals and activity expenses (transportation expenses are not included). We both believe that healing is a spiral with moments of expansion as well as contraction. As part of this, we're also including a pre-retreat group virtual Breathwork circle to set our intentions into motion ahead of our arrival. We're also including a private session with each Sandra and I in the month post-retreat. How to reserve your spot: A non-refundable $500 deposit through Venmo is needed to reserve a spot. Room reservations are first come first served. Look through the pdf below by clicking on the button. Email me at amy@amykuretsky.com to see if the room you'd like is still available. Payment instructions will be sent upon room confirmation. Join us for bi-weekly group Breathwork classes every Wednesday from 5:30-7pm at Constellation Acupuncture & Healing Arts. Breathwork is used to release old patterns and emotions and create space for new energy and ideas to grow and thrive. These 90-min events will be split into three parts: time to answer reflective questions through journaling, time to lay down and breathe together, and time after the breathing to share and witness. Breathwork is an active meditation that helps release old wounds, shed limiting beliefs, connect to your intuition, and allow intentions to integrate into the physical and energetic bodies. Breathwork strongly moves qi in the body and is a wonderful compliment to your acupuncture treatment plan. In this LIVE, virtual guided circle we'll facilitate a deep release with the breath. Breathwork is an active meditation that helps your body release old trauma, move though limiting beliefs, open your heart, connect with your guides, and deepen your intuition. We'll be utilizing group energy to deepen our practice and strengthen our intentions. This is a perfect way to add some self-care into your busy life from the comfort of your own home. This virtual circle will occur on Sunday, January 28th 2018, from 7:30-9:00pm CST. This group session will be held via Zoom (and recorded for those who can't make it live) with time for sharing and Q&A beforehand. You'll receive a link to join the Zoom call the day of the event. If this is your first time using Zoom, please give yourself an extra five minutes to download the free software.